2nd and 4th Sundays of each month, 11:00 a.m. (except Chicago Marathon Sunday). 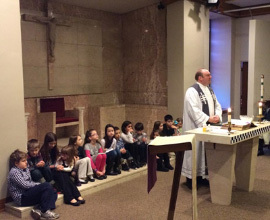 Chapel located at Mercy Home for Boys and Girls, 1140 W. Jackson Boulevard, Chicago, IL. Ample parking on surrounding streets, and in large parking lots with access from Aberdeen Street, between Adams Street and Jackson Boulevard. Please do not park in the Racine Avenue lot. Mass is typically over before 11:30 a.m. to accommodate on-duty worshippers. Fellowship with coffee and refreshments usually follows Mass in the cafeteria for those who can stay. However, we do not gather after Mass on holidays. While this is a Catholic Mass, all members of the CPD family are welcome, regardless of creed. Please note that on Easter Sunday, Mothers' Day, Thanksgiving and Christmas Day, Mass is moved up to 10:00 a.m.
On Fathers' Day, Mass is also at 10:00 a.m. -- but the venue is moved to Gold Star Families Memorial and Park. This is an outdoor Mass, so weather plays a factor, and guests are reminded to bring their own seating (lawn chairs, blankets, etc.). In the event of inclement weather, call the chaplains office to make sure the Mass is still on. 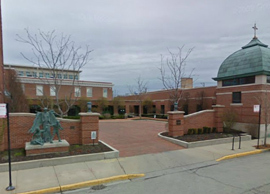 Also, please note: On the Sunday in October when the Chicago Marathon is run, we do NOT hold the CPD Mass at Mercy Home because our location is on the marathon route. Watch our home page for an alternate location on this particular Sunday. For more information, please call (773) 550-2369. People attending the Police Mass are asked to use the large parking lots accessible from Aberdeen Street between Adams and Jackson.